Let us give you Purple! If you will pay for shipping and promise to give them away, it is our pleasure to provide you with up to 20 of these evangelistic booklets at no charge. If you or your organization need more than 20 copies, please email al@whattimeispurple.com to make your request, including details for how you plan to distribute them. 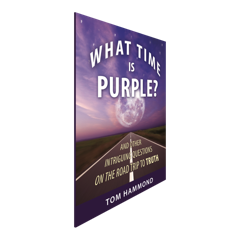 To read “What Time Is Purple” and/or receive information on how to distribute this booklet, visit whattimeispurple.com. Hi there! I bet you've come to the back cover of this booklet wondering if what's inside will be worth it. Who can blame you? Your time is your most precious commodity. If none of those things matter to you, you've already wasted 13 seconds. If any of those things do matter to you, and something tells me they matter to you a lot, you've come to the right place. It may take a few short minutes of your time, but it's going to be time well spent. I promise! Can we send you spam*?